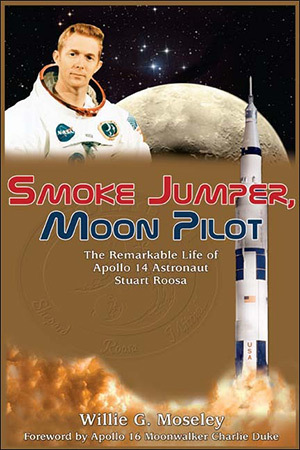 Apollo Astronaut Stu Roosa grew up with a love of hunting and the outdoors that was an important element in his whole life story. In the summer of 1951, before he started college, Roosa and some of his high school buddies took jobs in Idaho with the U.S. Forest Service on a project to control blister rust, a disease devastating to pine trees. They participated in firefighting as well, and encountered a team of smoke jumpers, the Forest Service’s first responders to remote fires. Small teams of these men parachute into remote locations where fires are just starting, fight the fires, then walk out to the nearest road to be picked up. They are sometimes on their own for days at a time. It’s a dangerous job; just two years earlier thirteen out of a crew of fifteen smoke jumpers had been killed in the firestorm that blew up unexpectedly in Mann Gulch, Montana. It’s the kind of work that breeds mental toughness and independence of spirit—qualities already in evidence in the teenager from Oklahoma—and Roosa was attracted to the job because he thought it would enhance his resume when he applied for pilot training with the Air Force. Fortunately, the nuclear superpowers managed to channel their opposition into less than total war, and instead competed via the race to the Moon in which Roosa eventually participated. First, though, there was test pilot school at Edwards Air Force Base, home of most of America’s legendary airmen at one time or other. Neil Armstrong had left his job at Edwards testing the X-15 two years before Roosa arrived, but Chuck Yeager was still commandant of the Advanced Research Pilots School there. Of the sixteen pilots in his elite class, four would become astronauts. Charlie Duke and Al Worden became NASA astronauts in 1966, in the same group as Roosa. Hank Hartsfield would join them a few years later after a detour through the Air Force’s Manned Orbiting Laboratory program. This part of the story gives the reader a view of a highly competitive, focused, hard-partying crew. Three of the Air Force officers in the class went on to become generals, all the rest became colonels, and the scores of the top four members of the class (including Roosa, Duke and Hartsfield) were less than one point apart. Roosa and his buddies in Astronaut Group 5 barely made it to the party in time; only half of them were assigned an Apollo mission. It says something about Roosa that he was one of the first to gain that distinction. He flew as command module pilot on Apollo 14, with Alan Shepard and Edgar Mitchell. Shepard was Chief of the Astronaut Office at the time, having been restored to flight status after a curative operation for Meniere’s disease. Shepard had plenty of time to observe his potential crewmates, and plenty of pull to get whoever he wanted assigned to his flight. Roosa had to have been a standout, even without any spaceflights yet to prove it. His conduct on Apollo 14 fully justified Shepard’s opinion. In Roosa’s personal kit, he carried several hundred tree seeds to lunar orbit, to be planted when he returned to Earth. All of this, though, is just a set of facts that make up a biography. How well does Author Willie Moseley do at bringing his characters to life? Better than some writers, not as well as others. Even allowing for the fact that his subject wasn’t alive to talk to, Moseley’s book feels a little dry. Yet the reader will not leave this book without knowing just who Stu Roosa was: a deeply religious, deeply patriotic, deeply competent man who was devoted to his family and brought up his children to reflect those values in their own lives. A good man to have on your team if you were jumping into the wilderness to fight a forest fire, or training to fly into combat, or venturing into deep space with no one else but your crew to bring you home. One thing in this story will leave you wondering. Roosa was CAPCOM at the Cape on the terrible day of the Apollo One fire that claimed the lives of the three astronauts scheduled to make the first Apollo test flight in early 1967. Later he told one of his sons that only two people knew what had really happened that day—Deke Slayton and himself. On another occasion he told another of his sons that “the investigation team got it wrong.” Just a few months before he died, his daughter said he seemed to want to talk about it, but “I could also tell it was painful, so I stopped him. Later I wished I had not done that.” What did he mean? Whatever Roosa knew, or thought he knew, that the rest of us don’t know about that tragedy, he took it with him to his grave. Please use the NSS Amazon Link for all your book and other purchases. It helps NSS and does not cost you a cent! Bookmark this link for ALL your Amazon shopping!